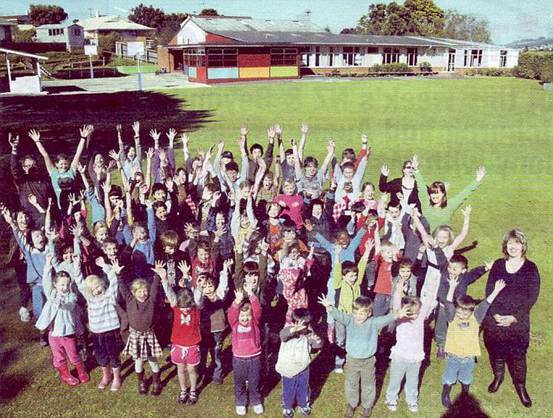 Hands-up: Students and teachers of Liberton Christian School in Dunedin. Liberton Christian School in Dunedin believes their ballooning roll is a sign of God’s blessing. Principal Fiona Sizemore said prayer was a key to the Pine Hill school’s growth. ”Our board of trustees is really committed to serving the Christian community—helping parents to educate their children in a way that honours God,” said Mrs Sizemore. The board of trustees has applied to the Ministry of Education for a roll-cap increase to a maximum of 100 pupils to meet the demand. An application to the ministry last year was denied because the ministry believed there were still plenty of spaces for pupils at other North Dunedin schools. The school was established in 1982 but was integrated into the state system in October 1999. The roll was increased from 62 to 75 in 2009. Mrs Sizemore said integration helped reverse a falling roll, and improve the school’s performance. While complying with the ministry’s national curriculum framework, the school’s years 1–8 curriculum is taught from a Christian perspective as set out in the school’s special-character statement. Mrs Sizemore hoped to hear from the ministry about the application by the end of term 1.